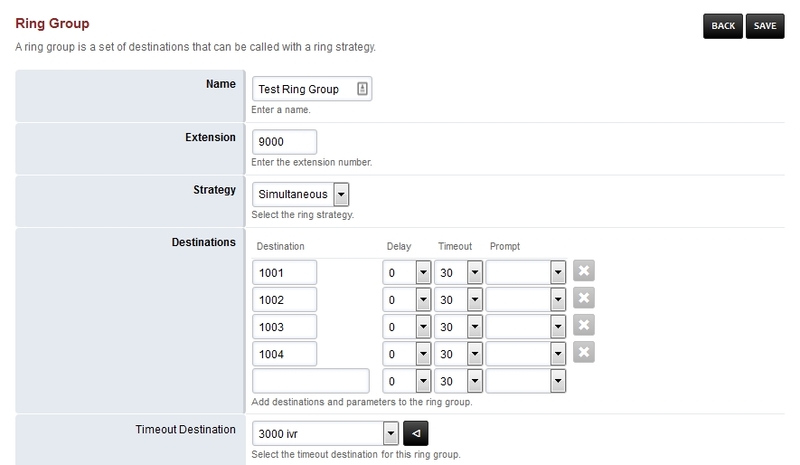 A ring group is a set of destinations that can be called with a ring strategy. To add a ring group click the plus. Click for the youtube video . Name A meaningful name for this ring group. This name is used in th Destination select list. Extension The extension number for this ring group. Greeting Play a sound file upon calling the Ring Group extension. Strategy The selectable way in which the destinations are being used. Simultaneous Rings all destinations. All destination share the same thread. Sequence Calls destinations in sequence where order that is lower goes first. Enterprise Ring all destinations. Each destination uses its own thread. Rollover Calls destinations in sequence and skips busy destinations. Random A random destination will ring. Destinations The extensions that this ring group applies to. Prompt Where you determine if the call must have a dial to confirm before a pickup event. Caller ID Name Prefix The string that is added to the caller ID when it displays on the ringing extension. 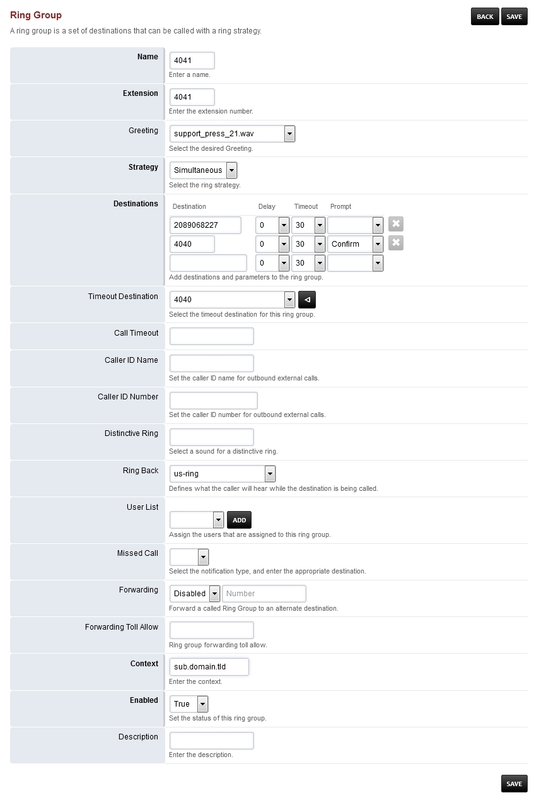 Caller ID Number Prefix The Number that is added to the caller ID when it displays on the ringing extension. Context The context defaults to the domain name. In our example we will have 4 extensions all ring at the same time until one of them pick up first. Click the + to create a ring group. Fill in the fields that are in bold. In the Extension box type a number that is NOT already created. This new extention won’t be in the extension list. The strategy will be Simultaneous. Enter in the destination the 4 extensions 1001, 1002, 1003, 1004.